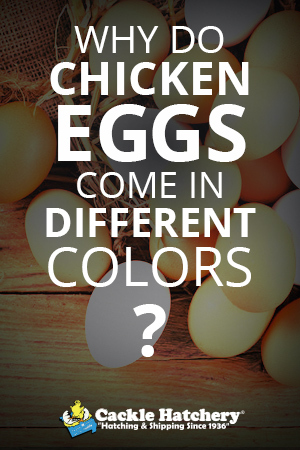 Why Do Chicken Eggs Come in Different Colors? Most eggs sold at the supermarket have white shells. So where do brown eggs and blue eggs come from? The color of the shell is determined by the breed of the hen that laid the egg. Most white eggs sold at the supermarket are laid by Leghorn hens. Many other breeds lay eggs with white shells. An egg with a brown shell started out as a white shell during the time the shell was being formed in the hen’s shell gland. The color is the result of brown pigments in the bloom — the last layer added to the outside of an egg just before it is laid. The bloom is what makes the shell appear moist immediately after the hen lays an egg in the nest. Bloom dissolves when it becomes wet and easily rubs off when dry, which is why cleaning an egg with a brown shell removes some of its color. Brown shell color is influenced by more than a dozen different genes, giving eggs with brown shells a wide range of shades from barely tinted off-white to nearly black. Eggs with the darkest shells are laid by Barnevelders, Marans, Penedesencas, and Welsumers. Because the brown color is on the outside of the shell, the inside of the shell remains white. By contrast, the pigment of an egg with a blue shell is spread throughout the shell, making the shell just as blue on the inside as it is on the outside. Eggs with blue shells are characteristic of the Araucana, named after Chile’s Araucanian Mapuche Indians from which this breed was obtained, and the related Ameraucana chicken. An egg with a green shell is the result of a cross between a blue-egg breed and a brown-egg breed, yielding blue shells with a brown coating. A dark brown pigment laid over a blue egg results in an olive colored shell. Hens that are bred to lay eggs with olive shells are called Olive Eggers. Like Olive Eggers, chickens called Easter Egg Chickens or Easter Eggers are not a specific breed. Each hatchery offers its own version of the Easter Egger, most of them including at least some blue shell genetics. Depending on the source, Easter Eggers may lay eggs with shell colors ranging in shades of blue, green to greenish blue, brown to pinkish, and white to pale yellow or gray. All chickens classified as Asiatic, and most of those classified as American (except Holland), lay eggs with brown shells. All Mediterranean breeds lay eggs with white shells. Other classes lay eggs with shell colors that may be white, blue, brown, or tinted (cream, light tan, or pinkish). All eggs laid by an individual hen generally have the same color shell, except that eggs with brown shells tend to get lighter as a hen gets older and lays larger eggs, because the same amount of brown pigment must stretch over a larger shell surface. Since shell color is governed by genetics, if the chickens in a breeder flock are not selected for shell color, the color may change in successive generations. In a general way, you can tell what color egg a hen will lay by the color of her ear lobes. Most hens with white earlobes lay eggs with white shells, and hens with red earlobes lay eggs with brown shells. Exceptions are Crevecoeur, Dorking, and Redcap, which have red earlobes but lay white-shell eggs; Araucana and Ameraucana, which have red earlobes but lay blue-shell eggs; and Penedesenca and Empordanesa, which have white earlobes but produce among the darkest brown shells of any breed. Other breeds that don’t fit the general rule are Sebrights and Sumatras, which have purplish earlobes, and Silkies as well as some Sebrights, which have turquoise earlobes — each of which lays eggs with white or slightly tinted off-white shells. A common misconception is that eggs with colored shells are more nutritious than those with white shells. In fact, the nutritional value of an egg is influenced by how a hen is raised, rather than by the color of the shell. Eggs from backyard hens — which can be any variety of colors — are generally more nutritious than industrially produced white-shell eggs because most backyard hens have the opportunity to spend more time foraging outdoors. So enjoy those nutritious eggs laid by your backyard hens, no matter what color the shells might be.